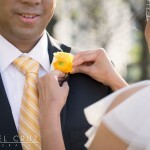 I was excited to shoot Vince & Sherryl’s civil wedding at the Cultural Center. Sherryl looked absolutely stunning, I absolutely loved her classic look with the birdcage veil. I loved how Sherryl coordinated her flowers with Vince’s tie and their dog, Maggie’s leash. Seriously cute family! Here are a few samples from their wedding.